This exhibition honoured the lives and contributions of women throughout Victoria. The third in a series of exhibitions presented by Her Place Women’s Museum Australia, it celebrated the work, achievements and historical significance of women through video interviews, photographs, biographical accounts and personal artefacts. The exhibition told the stories of ten women from across Victoria including the south west. These women have contributed to Australian society at both national and local levels through their work as artists and activists, farmers and businesswomen, scientists and community leaders. The group included a former state premier and the AFL’s first female coach. Many of the women featured in the exhibition have been inducted onto the Victorian Honour Roll of Women. Established in 2001, the Honour Roll pays tribute to women who have been pioneers in their field and who have improved the lives of women and the broader Victorian community. Each year, at the time of International Women’s Day, a new group of remarkable Victorian women is inducted onto the roll, thereby creating a significant record and increased awareness of the achievements and contributions of women in this state. The exhibition was accompanied by a program of public discussions and workshops that explored current and topical issues affecting women of all ages today. Her Place Museum also provided an engaging and wide reaching education program, including resources, available to both primary and secondary students and teachers. All lessons have been linked to the Victorian Curriculum to enable teachers to put them to their most effective use. 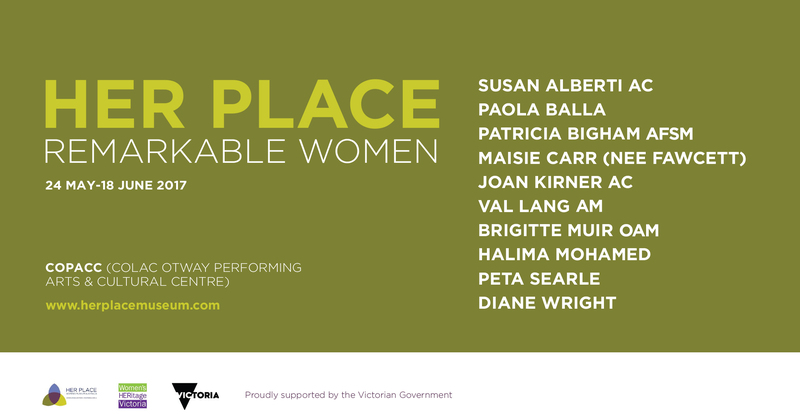 We also developed a Communications Toolkit (334 KB) as a resource for media, individuals and groups to raise awareness of the the exhibition Her Place: Remarkable Women and Her Place Women’s Museum Australia.